April « 2017 « They Said What? Health News Review just podcasted a wellness “debate.” I put “debate” in quotes because the other side — the Health Enhancement Research Organization — refused to participate, according to the moderator. The strategy of the Wellness Ignorati is to avoid actually telling anyone what they do, on the theory that the more people who know what they do, the more likely they are not to be able to get away with it any more. It’s a brilliant strategy, because transparency is one of their five worst nightmares, the other four being facts, data, outcomes, integrity, and me. The United States Preventive Services Task Force (USPSTF) just announced that for men aged 55 to 69, the Prostate-Specific Antigen (PSA) test grade is improving from a “D” to a “C.” Needless to say the media overhyped this ever so slight grade inflation, with headlines like: USPSTF Could Drop Its Opposite to Routine Prostate Screening. Reading beyond the headlines reveals not that you should run out and get your prostate screened. Rather, you should talk to your doctor about it. Hardly a ringing endorsement by USPSTF, and probably only reflects what is already happening during checkups. 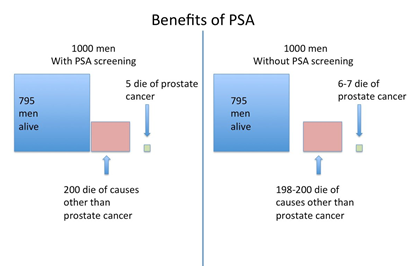 If 1000 men have the PSA test, 240 will have a positive results, and 100 will have a positive biopsy which shows cancer (but 20-59% of these will be cancer that does not grow, spread or harm the individual). Of the 100 with a positive biopsy, 80 will choose treatment (surgery or radiotherapy), and 60 will suffer serious complications (including incontinence and impotence), with the net results that 3 men (out of the initial 1000) will avoid metastatic disease and 1-2 men will avoid prostate cancer death. Surgery? Incontinence? Impotence? I’m onto Wife #2 (#3 if you count the one who died…), and without getting into TMI here, the whole point of having a Wife #2 seems to be at variance with this USPSTF recommendation. But let’s keep going. One or two men (of this 1000) will avoid prostate cancer death. Since there are about 26,000,000 men in that age cohort, it seems like the benefits of PSA testing would be high. Let’s take the low, conservative estimate that 1-in-1000 will be saved. That’s 26,000 lives saved through the PSA test. Not bad, I must admit. But then I do that thing which wellness vendors hate — a plausibility test. Turns out that annually only 26,000 men die of prostate cancer to begin with. Presumably some number of them — let’s say 11,000, yielding 15,000 — are not in the 55-69 year-old age category. Unless, then, that prostate test is better than perfect, something is amiss. It wouldn’t be possible to save more than 15,000 lives. A close read reveals the missing link: to get this 1-per-1000 benefit, you’d have to be screened for up to 15 years. So in any given year, only 1/15th of these estimated 15,000 men would have their lives saved. Or something like that. That’s 1000 lives saved annually, or possibly 2000, if it’s 2-per-1000. So, yes, I will take the USPSTF recommendation to “talk to my doctor,” and tell her to please leave my prostate alone or I’ll find another doctor.